In 1832, missionaries David and Sarah Lyman traveled by ship from New England to Hawai`i. They had been married for all of 24 days before leaving on the six-month voyage. In the late 1830s they built the Lyman House as a family home. The Hilo Boarding School, a school for young Hawaiian men founded by the Lymans, was built nearby. Over the years, the house became a place to raise their seven children and host guests, including many of the Hawaiian ali`i (royalty) and other notables such as Mark Twain and Isabella Bird. The Lymans never returned to their native New England, but lived out their long lives in Hilo. 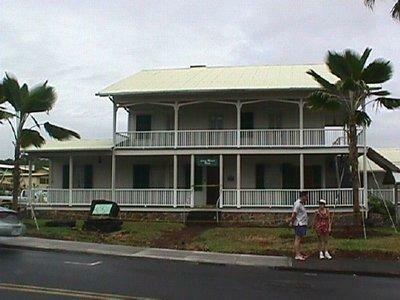 The Lyman Mission House is the oldest standing wood structure on the Island of Hawai`i and one of the oldest in the State. It features furniture, tools, household items and artifacts used by the Lymans and other early missionary families. The house is on the State and National Registers of Historic Places and is an important artifact of the Lyman Museum.